The Orient Kano , the Japanese brands latest value packed diver . Nice, I like that. Great VFM as usual from Orient. (Wearing a White-faced 300m Orient Saturated Diver as I type ). What’s unusual about it? Looks very run of the mill to me. It's Mako XL substitute. Also there is smaller version in 41 mm. Too big unfortunately, but that aside it's a good looking watch for a decent price. Although I don't know anything about Orient movements, is the F6922 OK? Am I the only one who can't see the Orient branding without thinking of Embassy Regal? My only concern about the modern Orients is the crowns. I bought an Orient Mako Mark 3 and returned it after 24 hours, the crown was dreadful and so fiddly. The Mako Mark 1 crowns were superb, so what went wrong I'm not sure. Hopefully this model is better, but crowns are an achilles heel for Orient as a brand. Yes Orient is owned by Epson, who were originally watch movement manufacturers who provided movements to the likes of Seiko. People typically misunderstand that its the other way round, but Epson didnt start out as copier/printing! They are actually watch movements and precision parts manufacturer! hence I always feel Orient is much more VFM vs say the equivalent seiko line. That's actually quite nice and a nice way to introduce some colour into the collection. Would make an ideal holiday watch/beater for dodgy destinations. 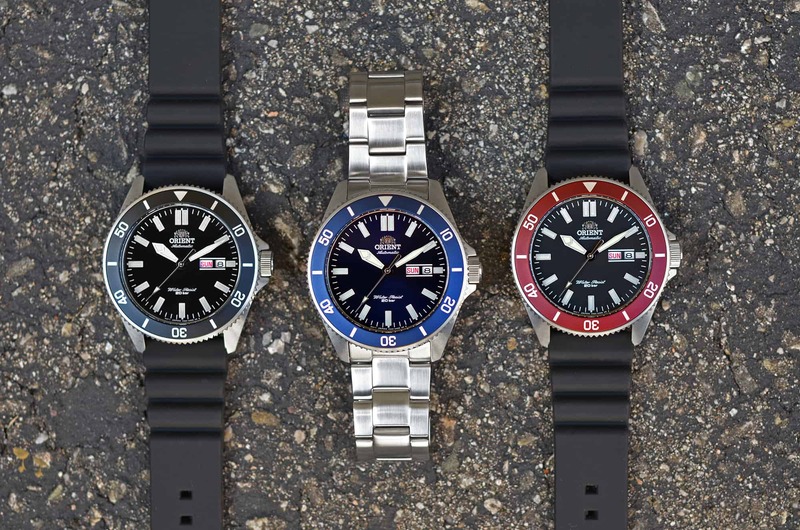 Very good new watch choices from Orient. Would be more attractive if they have versions with sapphire crystal. Very nice. I quite like the looks, black classic and the one with cherry bezel. What is the size? 44mm? Any bracelet options? And isn’t Epson owned by Seiko? Bulova is owned by Citizen, Swatch group has numerous brands like Seiko...and the same is with the car industry, so what is the point? Last edited by martyloveswatches; 15th April 2019 at 07:37. Anyone know when these will be on general sale?